It is that time of year again when the weather will hopefully break and farmers start to think about how to engage people out on the farm. Whether it is lambing days in the spring, pick-your-own events in the summer or pumpkin patches, planning often starts early. One annual event that we are particularly passionate about at JCM, and is now firmly established as the farming industry’s annual open day, is LEAF Open Farm Sunday. The event, which takes place on 10 June, sees around 400 farmers welcome the public onto their farm. By showcasing what real farming is all about we bring together the whole farming industry across Britain – from Cornwall to Orkney, and occasionally international. This collaborative approach to public engagement is becoming more imperative as we try to reduce the amount of misinterpreted or factually incorrect information shared with our consumers. To date, over 110,000 visitors have attended LEAF Open Farm Sunday events across Scotland, with over 2 million across Britain. The staggering national statistic highlights that 1 in 5 visitors had never visited a farm before, and with a growing interest in the farming community, it is up to us as farmers to help bridge the gap. 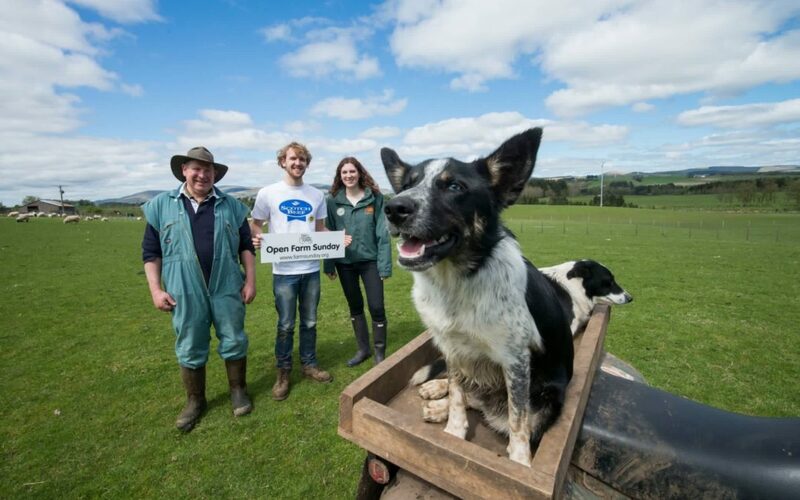 In 2017, the LEAF Open Farm Sunday UK wide visitor survey highlighted 89% of visitors said they felt more connected to the farmers who produce our food following attendance at an event. 91% of visitors were more appreciative of the work farmers do and 73% said they now more actively look for British produce to buy since visiting a LEAF Open Farm Sunday event. It’s not a requirement to have a farm diversification or direct sales business but for those who do, LEAF Open Farm Sunday can boost your business attracting new customers and giving your current customers a chance to experience the farming stories behind your brand. It is also a great opportunity to raise money for charities and causes with our farmer research estimating £80,000 was raised in 2017 at events. Start with something small like a farm walk for a limited number of people. The public love to see what we do on a daily basis so there is no need to add anything extra to your farm. A visit to see the hens and pick up the eggs, a chance to watch you feed the sheep or milk the cows or a walk through the crops/vegetable plots offer your visitors a unique experience. Consider using the LEAF Open Farm Sunday booking system so you can manage your visitor numbers. This gives you some added control and confidence when planning your day, whether it is for 10 people or 100. You don’t need to run the event for a whole day, a few hours is sufficient – just make sure you clearly advertise this on all your promotional materials. As soon as you have decided to take part register your event at www.farmsunday.org. Once registered we will send you a host handbook that will provide lots of tips and recommendations to help you plan your day including activity ideas, promotion, how to order your free resources (gate banners, leaflets, posters, information sheets, freebie giveaways, etc. ), risk assessment templates and health and safety guidance. Give yourself enough time to plan the day, and invite other local farmers and friends to support you. Even if you are hosting a farm walk, writing down some short notes will help ensure you don’t miss anything. Open Farm Sunday is all about giving the public an opportunity to see for themselves the great work we do as farmers. We don’t get many opportunities to tell our story direct to the consumer – so let’s make the most of it! Rebecca Dawes is LEAF’s Open Farm Sunday Scotland Coordinator. She and her family have taken part since it was established in 2006 hosting events on their family mixed livestock farm. She works for Jane Craigie Marketing who support LEAF to engage with more farmers in Scotland.